Australia’s No. 1 hotel… Emirates One&Only Wolgan Valley. Recently voted Australia’s No. 1 hotel in TripAdvisor’s 2016 Travellers’ Choice Awards, Emirates One&Only Wolgan Valley in the Blue Mountains takes luxury to new extremes. I had the pleasure of staying here a few years ago on a famil for Wellbeing magazine, and it’s is etched in my memory as the most overwhelmingly lavish resort and spa experience I’ve ever had. If you can wear the all-inclusive cost, I highly recommend splurging… if only for a night! Below is the original review, which you can also read on Wellbeing‘s website here. I’ve updated a few details from the original article. 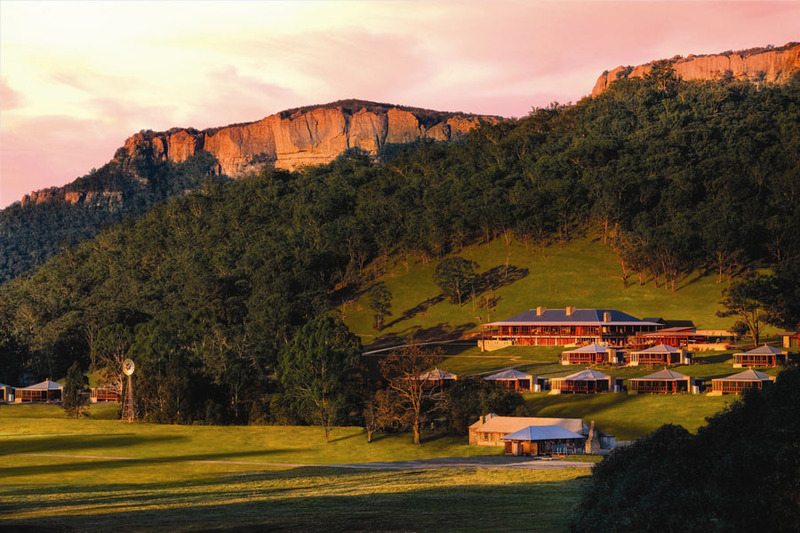 Set on a 7000-acre conservation reserve in the Wolgan Valley in the Greater Blue Mountains and walled by dramatic sandstone cliffs, Emirates One&Only Wolgan Valley isn’t a place people stumble on by accident. Unless, of course, they’re browsing any luxury travel website or magazine written in the last five years. But “stumble” I did when, after canyoning in the Blue Mountains and taking in the view of Donkey Mountain and the Wolgan Valley below, a shimmering resort pool and constellation of what looked like designer homes caught my eye. I had heard about the Emirates-run resort before and also about the three albino wallaroos that were said to live on the premises, but considered it an almost fabled destination reserved for wealthy international tourists and seclusion-seeking celebrities. Now, here it was before me in the middle of nowhere — very real and very enticing. What makes a stay here so appealing is not only the luxurious elements, which include one’s own private villa and swimming pool, along with all meals, most beverages and on-site field activities included in the tariff, but the fact the resort is carbon neutral and devoutly committed to preserving its natural surrounds. So not only do you get to enjoy all the good things that come with a five-star hotel but you can do so without environmental guilt. The guiltlessness starts the moment you arrive: guests park their cars at the property entrance and are transported to the main homestead in specialised four-wheel drives whose carbon emissions are tracked and offset by various green initiatives. The resort uses 35 per cent renewable energy sources, sends its laundry to an eco-sensitive local launderer, uses biodegradable cleaning products and recycles its domestic water. In the buildings’ construction, recycled materials were used where possible and not a single tree was uprooted during the development process. This knowledge does much to increase the pleasure of stretching out on the Heritage Villa’s four-poster king-size bed, washing under the sky-lit waterfall shower or wading in my personal lap pool with a view past the windmill, the kangaroos and down the valley. The challenge is working out how to fully appreciate every aspect of the experience in a way that makes the memory of staying here as vivid as the stay itself. One way to show your full appreciation is by visiting the One&Only Spa. Available to guests of the resort only (no day visitors allowed, unfortunately), it has six double treatment rooms, each with its own bathroom and Japanese-style soaking tub, and each with a view over the serene valley. Or if the weather allows, you can choose to have your treatment outdoors. 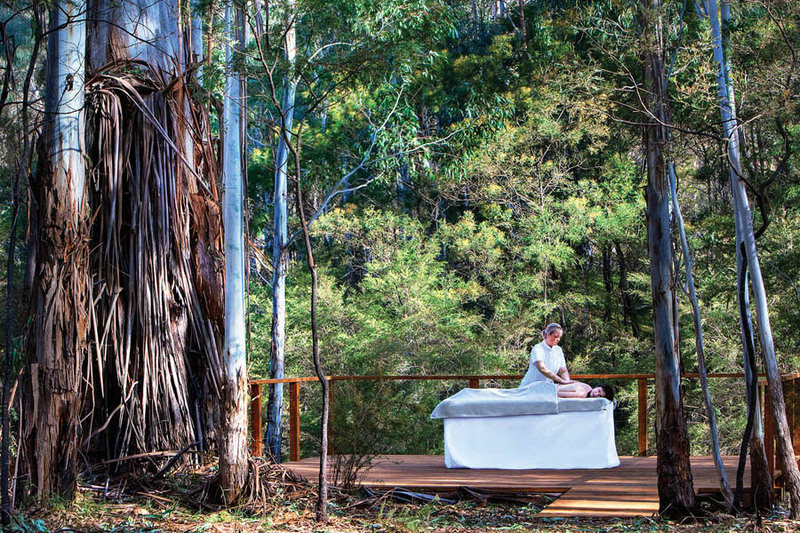 Bush treatment… an outdoor massage at Emirates One&Only Wolgan Valley spa. A range of wraps, massages and exfoliations is offered, including treatments by the chemical- and preservative-free Australian spa care brand, Sodashi. I choose the Sodashi Soul to Sole therapy, which focuses on the often-neglected extremities: head, hands and feet. It begins with an aromatic head wrap and scalp mask: essential oils are massaged into the scalp with the kind of pressure and intensity always craved at a hair salon but never quite received. It is truly an out-of-body experience. But you want to make sure you’re fully present for what follows: a tingling hands-and-feet exfoliation with jojoba beads, finishing with a lengthy massage that extends up the forearms and calf muscles, the latter using Sodashi’s soothing foot cream containing mint and arnica oils to boost circulation and reduce swelling. Take up the offer of a ride in an electric buggy back to your villa, where you can relax and let the hair treatment of white clay, rosemary, lemon and jojoba oil penetrate before washing. It will honestly make your hair feel levels beyond what you’re used to — lush, smooth and much healthier. But the day at Wolgan Valley is far from over. Mealtimes, especially dinner, are another experience to be savoured. With ingredients sourced from a 160km radius, a selection of complementary local wines included in the menu and world-class chefs in the kitchen, this is sustainable dining at its best. Dinner is a five-course journey in modern Australian cuisine, from canapés on the balcony to the main event in the Wolgan Dining Room, where throne-sized chairs engulf you as you make your way through lamb rump from Cowra, line-caught trout from Oberon or Venison from Mandagery Creek. A must-not-miss is the wine and cheese room, where one of the connoisseur staff members (most of whom live on the property) will guide you through odiferous wheels of crumbling and molten local cheeses. Luckily, there are several field activities available to counter whatever excesses are enjoyed, from guided bike rides to bushwalks, horse riding and nature safaris. Be sure to take your binoculars with you because you’ll want a close-up when you stumble across the white wallaroos, which are as at once real and dreamlike as the entire Wolgan Valley experience. Have you stayed at Emirates One & Only Wolgan Valley? What did you think? Or is it on your bucket list?